Daniel Defoe’s shipwrecked hero (1719) and his man Friday seem to have made their first appearance on the musical stage as the subject of a pantomime, Robinson Crusoe, or Harlequin Friday (1781), written, so it is said, by no less an author than Richard Brinsley Sheridan. Since that time, Mr Crusoe has remained an intermittently popular feature of the British pantomime season, whilst also serving to animate a number of other musical stage pieces of which the best known is probably Offenbach’s opéra-comique version of 1867, written to a text by Hector Crémieux and Eugène Cormon. In spite of being a 32-performance failure at Paris’s Opéra-Comique (23 November 1867), the piece was subsequently played in New York (6 September 1875), repeated in a much-altered version as Robinsonade in Leipzig (21 September 1930), in Zürich and Prague, and ultimately shown in London (ad Don White) at the Camden Festival of 1973. 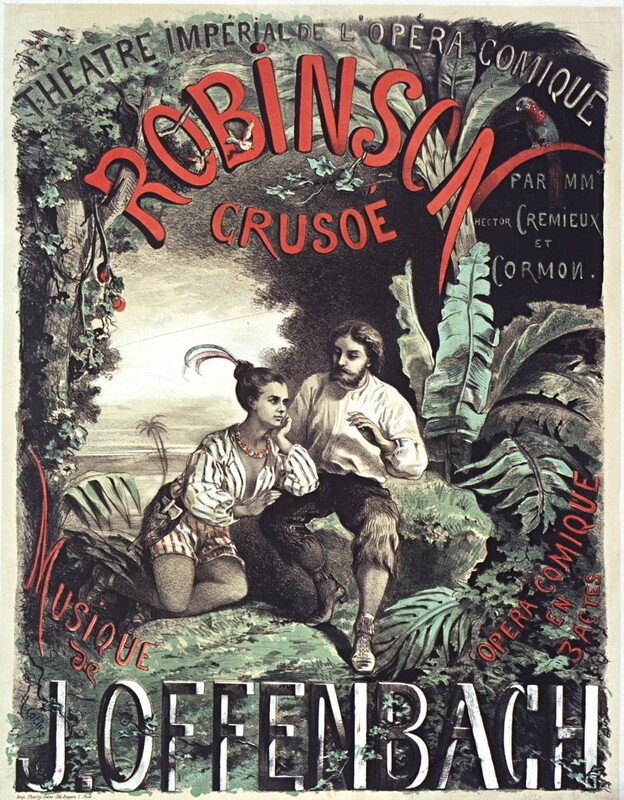 An earlier Paris opérette, written by William Busnach and composed by Jean-Francis Pillevestre, was played at the Fantaisies-Parisiennes in 1866 (21 February), but Italy had got off the mark much more swiftly with a Robinson Crusoe, music by Vincenzo Fioravanti, produced at the Naples Teatro Nuovo as early as 1828. A German musical Robinson Crusoe appeared at Berlin’s Belle-Alliance Theater on 11 November 1881, Ernest Blum and Pierre Decourcelle produced a pasticco spectacular on the famous castaway – which managed to get Father Christmas into the proceedings – for the Théâtre du Châtelet in 1899 (mus: Marius Baggers, 20 October), Adolf Philipp and Wilhelm Hock, with music by Hans Lowenfeld, supplied a similar piece for Hamburg’s Stadttheater (10 December 1901) and Karl Josef Fromm and Alexander Ludwig were responsible for a four-act spectacular produced at Vienna’s Kaiser-Jubiläumstheater in 1904 (3 April). Spain’s Robinson Crusoe (Teatro Circo, 18 March 1870), again an opéra-bouffe and following as so often where France led, was composed by Francisco Asenjo Barbieri to a text from Jose F Godoy and Rafael Garcia Santisteban, and lasted a little better than most – it was still on display in Madrid in 1992. In Britain, outside the pantomime productions, Robinson Crusoe appeared in burlesque at the Strand Theatre (12 May 1845) as depicted by E L Blanchard, as Crusoe the Second (Lyceum, 1847) in a piece by J H Stoqueler, in H J Byron’s Robinson Crusoe (Princess’s, 1860), a multiple-authored piece, in which W S Gilbert had a hand (Haymarket, 1867), an Alfred Thompson piece about How I Found Crusoe (or a Flight of Imagination fron Geneva to Cosmopolis) which burlesqued Stanley’s much-publicized trip to `find’ Livingstone (1872), H B Farnie’s The Very Latest Edition of Robinson Crusoe (Folly, 1876) in which Lydia Thompson was the hero and Willie Edouin Man Friday, and a second piece by the same author and Robert Reece produced at the Avenue in 1886. In 1894 a Crusoe the Cruiser by J Wilton Jones was seen on the touring circuits. In Hungary, the Népszinház mounted a spectacular piece taken from the Blum/Decourcelle show, with a musical accompaniment composed and arranged by József Bokor (2 June 1900), in Paris Victor de Cottens, Robert Charvay, Harry Fragson and Maurel combined to turn out a punning Robinson n’a pas cru Zoë (22 December 1899) for the Boîte à Fursy, whilst, in America, a little ‘chorale’ piece called Robinsonade (A Darr/Nat Childs) ‘illustrating the career of Crusoe from the time of his embarkation at Hamburg … to his safe return home’ was mounted as a forepiece to America’s first sighting of Die Fledermaus (Boston 29 March 1880), and an extravaganza, Robinson Crusoe Jr, was produced at the Winter Garden Theater 17 February 1916 (Romberg, James Hanley/Atteridge, Edgar Smith) with Al Jolson starred. This last show included perhaps the most memorable bit of Crusoe-iana: the popular song in which George W Meyer, Sam M Lewis and Joe Young demanded ‘Where Did Robinson Crusoe Go (with Friday on Saturday Night)?’ The song was given to Londoners in the revue Follow the Crowd (1916) as sung by Ethel Levey. 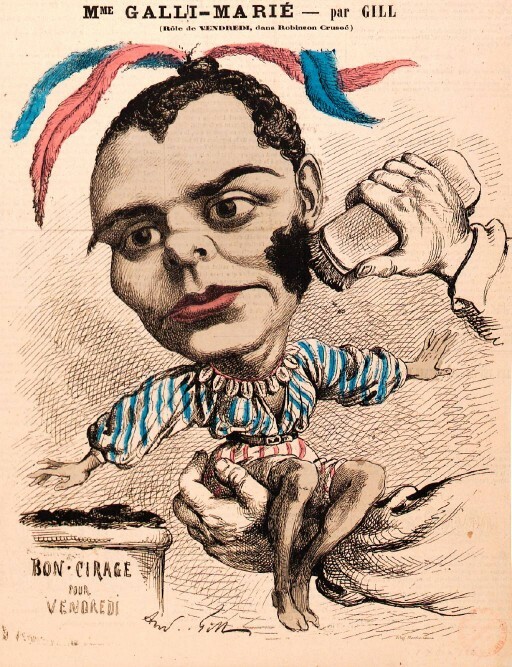 France, of course, managed to get the girls in on the act, and Paul Ferrier and Louis Varney’s Miss Robinson (with Vauthier as Crusoe) was produced at the Folies-Dramatiques in 1892 (17 December).